A high quality noise source is necessary for any good crytpographic enclave. In fact, multiple high quality noise sources are preferable, if the budget allows. On-die RNGs such as ring-oscillator based RNGs leverage the metastability of sampling circuits to translate timing jitter into a random stream of bits. These are area and power efficient but are also tricky to verify. They are particularly vulnerable to subtle mask-editing attacks. In addition to an on-die RNG, betrusted’s entropy pool in reinforced by an externally testable noise source. Avalanche noise sources fit the bill, as they can delivery reasonably high quality entropy and verification can be done using a low-end “economy” oscilloscope. The challenges of avalanche noise sources include the need for high (10-30V) voltages (and correspondingly high power consumption), and there the amount of noise generated depends on subtleties such as the engineering of the PN junction and the ambient temperature. Here we discuss the design and implementation of an avalanche noise source suitable for integration into a low-power, small-footprint mobile device. Readers who just want to skip to the design can safely jump over this section. However, few discussions of avalanche noise sources address the theory of the noise source, which is important to understand when trying to rationalize power and component selection. If you plan to adjust or tweak the design, it’s recommended you at least skim this section. Vbr increases as the temperature increases: as temperature goes up, so does lattice vibrations. Electrons are thus more likely to be scattered before they can be accelerated to a sufficient momentum to initiate the avalanche cascade. Thus a given junction engineered for a fixed Vbr exhibits decreased noise at higher temperatures. When confirming the performance of an avalanche noise source, it’s therefore important to confirm its performance at the highest expected operating temperatures. In order to engineer a low voltage breakdown, the doping Na and Nd must be so high that the depletion region shrinks to a distance on the order of 10nm, such that quantum tunneling becomes the dominant effect. Quantum tunneling is synonymous with the “zener” effect, and is a different physical process which generates less noise. Thus for reverse-breakdown junctions that operate below 4.5-6.5V, the process is predominantly a zener effect and not as suitable for noise generation. This explains why avalanche noise generators must operate at higher voltages. Note that Vbr decreases as temperature increases for the zener effect, opposite the avalanche effect. Thus “zener diodes” sold for the purpose of voltage regulation are actually engineered to use a combination of quantum zener plus avalanche effects, as they have opposite temperature coefficients and can lead to a more temperature-stable voltage reference. They hybrid engineering of the zener diodes has lead to some confusion when selecting suitable parts as an avalanche noise source. However, zener diodes above 7V or so start to rely more and more on avalanche breakdown, so one may more accurately call a high voltage zener diode an avalanche breakdown diode. Note that avalanche diodes to be used as voltage references are engineered to be less suitable as a noise source. Obviously, if the goal of the Vbr is as a voltage reference, reduced noise is highly desired. Generally, noise can be reduced by operating the diode at a higher current: more carriers means more opportunities to initiate the avalanche cascade. However, simply cranking up the current would also waste power. 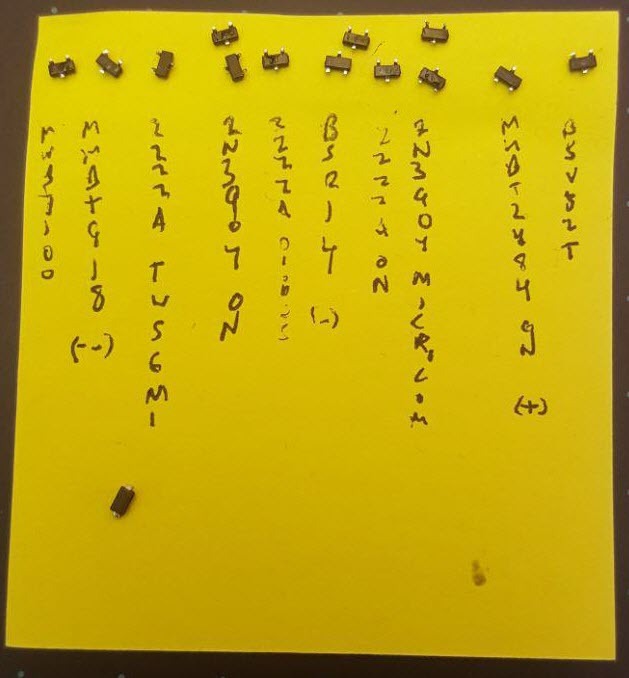 Thus avalanche diodes engineered as a voltage reference are designed so that the junctions are “leaky” compared to a typical rectifier application – perhaps through a very large area junction, with trace amounts of minority carrier dopants added to seed reverse leakage. Increasing low-level reverse-bias leakage reduces avalanche noise at lower current levels, because the tiny leakage helps “seed” the avalanche effect more consistency. A variety of inexpensive zener regulators as well as ESD protection diodes meet this criteria. ESD protection diodes in particular care little about how much avalanche noise is generated, and may prioritize lower leakage in reverse bias instead. The heavier the emitter doping, the lower the Vbr. And emitters on NPN transistor are heavily doped, so Vbr tends to be in a the range of 5-12V. The low breakdown voltage and wide availability of NPN transistors thus makes the device appealing. Unfortunately, the threshold between zener breakdown and avalanche isn’t a clear line; in fact, NPN transistors with breakdowns approaching the 5V range exhibit behavior closer to zener breakdown (quantum tunneling) and are thus less suitable as a noise source. Furthermore, because NPN transitors are not well-characterized for their reverse B-E breakdown, the quality of the noise generated can vary widely between manufacturers and models. The Internet also contains anecdotes that over time the B-E junction “wears out” over a period months and the quality of noise degrades, but there is no discussion of mechanism or backup with measurements. Fortunately, most of these requirements are met by a class of regulators meant for controlling LCD blacklights and/or white LEDs. Photonic flux of an LED is proportional to current (not voltage) and thus for consistent light output across a wide range of devices LED regulators are almost always constant current sources. The desire to stack multiple LEDs on top of each other means almost all of these devices have very high voltage compliance as well. The TPS61158 is identified as one of many suitable devices, this one chosen because it has a voltage cap at 30V, and features reasonable standby power and quiescent current draw. There may be others with even better characteristics, but the search stopped with this part because it met the desired properties of the circuit. The final configuration simply replaces the LED string with a PN junction in reverse bias, along with a resistor stacked above the PN junction to provide some voltage compliance for the noise to generate. The voltage compliance is pure resistive power loss, so we target around a 1-2V compliance voltage, as the anticipated noise voltage is around 500mVp-p. The main risk point of the circuit is operation at extremely low currents; the circuit is normally specified to provide 20mA of current, and we are operating it around a few uA. The low current operation may lead to instability in the regulator control loop and cause problems with circuit startup, so this needs to be characterized carefully. The cathode of the noise generator is AC-coupled to a resistive divider that centers the noise within the sweet spot of an amplifier that provides a 6:1 gain on the generated noise. More important than the voltage gain is the impedance matching to the sampling circuit. The noise generator runs at a very low current, and thus is incapable of driving any significant load. Thus even if the amplitude of the noise source was sufficient for direct sampling or use, a signal conditioning buffer of some sort would still be necessary to provide sufficient drive current for the ultimate circuit load. The target sampling circuit in this case is a 1MSPS 12-bit ADC with a 0-1V input range. Vbr is the measured breakdown voltage at a 3.16uA bias current and roughly 3V of compliance provided by the ballast resistor above the diode. Note that the measurement limit for noise is around 70mVp-p, so some NPN transistors were possibly generating little to no noise. In general, it was observed that devices with higher breakdown voltages would generate more noise. We settled on a 15V zener diode (MMSZ15T1G) as the initial device for noise generation. This device is squarely in the middle of the range of the TPS61158 regulator, is comfortably above the zener threshold, yet not excessively high (as a higher voltage would lead to higher power dissipation), and is guaranteed by the manufacturer to breakdown at a certain voltage. Although more noise was witnessed on a 24V breakdown device, operation near the cutoff threshold of the TPS61158 made the circuit unreliable under some startup conditions. Any lack in amplitude could be restored anyways by the follow-up signal conditioning circuitry. Above is the initial noise trace as measured by the circuit. One key observation is that the maximum frequency of the noise is quite high (» 1MHz), which leads to some bandwidth degradation as it feeds into the low-power op amp (GBW of 1.4 MHz). The bandwidth of noise, and to a lesser extent the amplitude, can be tuned by placing a small capacitor in parallel with the avalanche junction. In this case, the MMSZ15T1G has about a 110pF or so depletion capacitance, so the parallel tuning capacitor should be sized around one order of magnitude larger. Basically what the parallel capacitor does is bleed away some of the current feeding into the junction, causing it to build up a field more slowly and thus reducing the bandwidth. 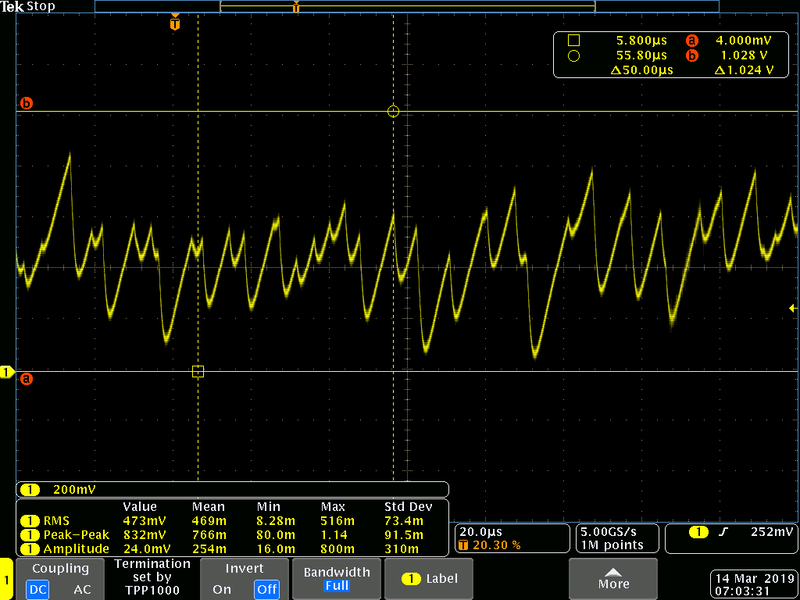 With a 1500pF capacitor placed in parallel with the noise source, we observe the following optimized noise trace, measured after the signal conditioning amplifier. The noise in this case has a bandwidth that is suitable for sampling by the 1MSPS ADC, and the amplitude is close to 0-1V. generates noise at 0C and 80C. At 0C the noise is about 50% larger in amplitude, at 80C it’s about 50% smaller in amplitude. The voltage on the regulation capacitor has a non-trivial amount of ripple. This probably applies a signature on the noise generated. The TPS61158 draws about 1uA through the feedback pin, which means of the target 4.2uA bias current, 1 uA is shunted into the feedback pin (resulting in 3.2uA going into the diode). The overall footprint is around 1 cm^2, and can be optimized further by going to a smaller inductor. The inductor initially chosen for the test circuit is greatly oversized for the application (just in case higher current were needed for testing). A much smaller inductor, perhaps an 0603 or 0805 part, could be used thus reducing the footprint even further. 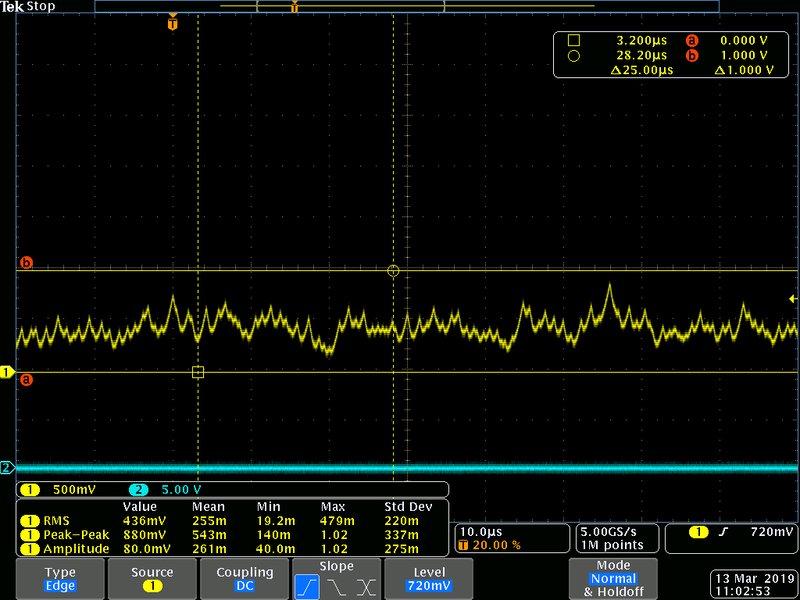 For example, a TDK MLZ1608M220WT000 is in an 0603 package and saturates at 55mA. This should be sufficient given the operating current of 3uA, although there is some question about the inductor’s performance during power-on.